Each fall, I have to schedule approximately 100 students. I finally discovered a scheduling solution that was free, simple, and fast. It no longer took me two weeks to make the schedule. I completed the schedule in just a few hours on a Saturday. This solution works for both large and small studios. Like my longer post post on studio policies and makeup lessons, this post is practical. 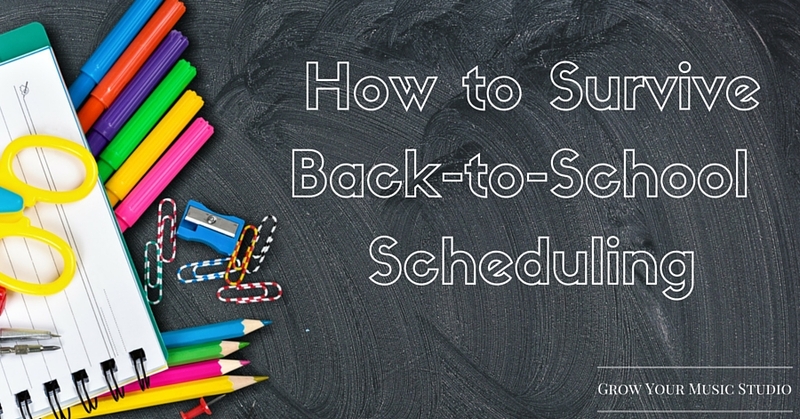 When you finish this post, your fall scheduling process will be easier than ever. Even if you already have an effective method for scheduling, you should check out the section called “Getting Creative.” There are some unconventional, quirky ideas for getting the most out of a boring scheduling process! The easiest way to create your fall schedule is to send a survey out to your families. You can do this using Google Forms, Typeforms, Polldaddy, or Survey Monkey. A survey prevents your email inbox from being overrun with responses from parents. With a survey, you are far less likely to lose a response from parents. Furthermore, you can quickly see who has filled out the form. No more scrolling through pages of emails looking to see if a particular family has responded yet. 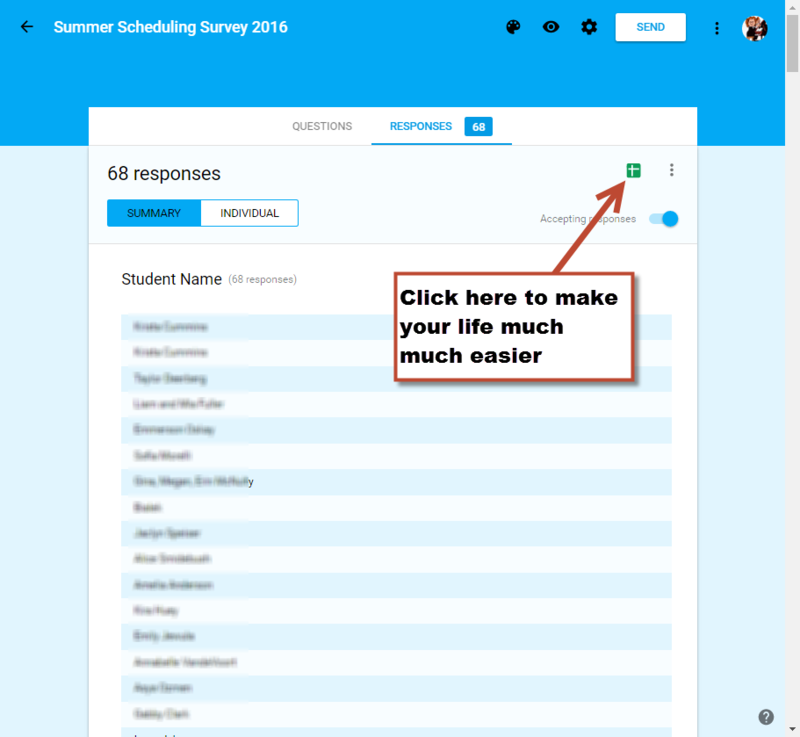 What Should You Put on Your Scheduling Survey? You can collect a lot of data using the survey, or use it as an opportunity to update all your contact information for your students. And (of course), don’t forget to ask for the name of the student! I actually forgot this on the first survey that I ever sent out. When the first response came back, I checked the response and realized that I had mistakenly left it off! I quickly went in and adjusted the form. This might seem like boring information, but it can be useful. Each year, I check to see if there are any trends in my enrollment. It also has helped me create a visual picture of where I should be advertising for my studio. 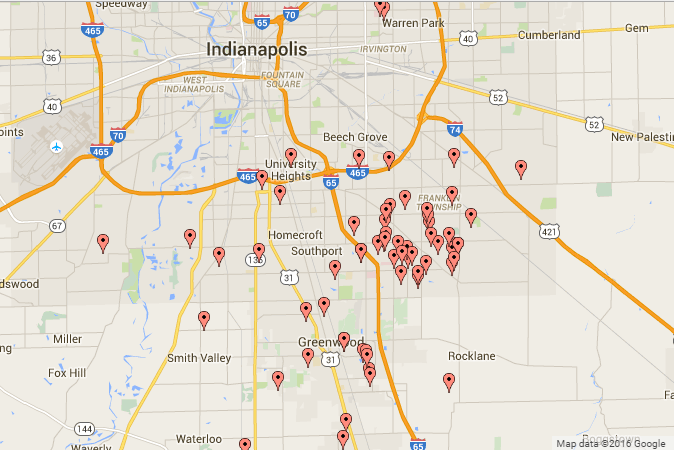 I tweaked my advertising strategy based on the first few times I created a map like this. I teach group lessons for beginners. I also have to schedule individual lessons for intermediate and advanced students. You might not teach group lessons, but, this method can still work for you. As you can imagine, scheduling a mixture of group and individual lessons can be tricky. I have tried several different ways of scheduling. I have found one way that works the best. I recommend that private lesson teachers do a slight variation of this format. Break the categories into “TIME GROUPS” instead of days and ask that parents pick a slot from each group. Make it “REQUIRED” that you have to pick a slot from each group.One of the groups should be ALL late slots. This prevents you from getting back a majority of responses all asking for 4:30p. Unlike most group teachers, I do not break up my students strictly by level. I organize by “level ranges.” For instance, early Faber, middle Faber, late Faber. There are enough common concepts that make group work possible in those level ranges. When I create the fall survey, I start by looking at the NON-group students first to figure out where I can fit them. If there is low demand for a few group slots (like…Thursday 5:30p), then I will use that hour for advanced students. 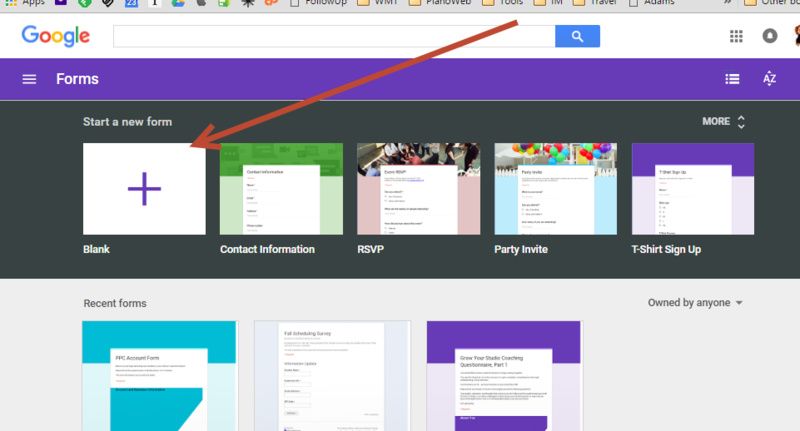 If you don’t teach groups, I recommend that you send out invitations in batches of 10. Start out with your best / favorite students. When they choose that prime afternoon real estate, take it off the survey completely. I have not included a link to my full Google form. If you would like to see an example of a live Google Form in action, check out Sara Campbell’s post on fall scheduling ideas. She gives some additional great ideas in that post, as well. What About Traveling Teachers? What About Music Schools? Now, I will admit that this works best for studio teachers. What about music schools or private teachers that offer traveling lessons? The logistics of your arrangement make this trickier. I was once a traveling teacher, so I am well aware of your pain. Instead of asking for specific time slots, you could send out a survey that asks for ranges. And, you should make the ranges overlap! For instance, you should ask if they are available from 3p-5p, 4p-6p,5p-8p. Also, you could ask them to include “amendments” to their choice in the comments box at the bottom of the page. For instance, they might be available from 3p-5p but they have to be out by 4:45p for soccer practice at 5pm. They could include that in the comments box. Once again, traveling lessons are the hardest to schedule. So, this will help ease your pain through automation. Similarly, if you have a music school with multiple teachers, you will need to make individual forms for every single teacher at your school. It is up to you if you have them manage it or not. I will often ask parents for feedback or testimonials. I will ask for referrals. People don’t always follow through…or even respond to my requests! Do you want to know how to get 100% feedback on these requests and favors? Include them with your fall survey! Include a testimonial request to complete right away or include a link that goes to a testimonial page. Collect the testimonials on your Google Places page, Web site, Thumbtack, or Facebook page. Do you want to know how to create great marketing? Get in touch with what your customers want. You could use your scheduling survey to ask questions that clarify your marketing message. Are you thinking about starting a new after-school program? Or running a summer camp, fall break, or winter camp? Or having your studio join a new program, like the Royal Conservatory of Music? You could gauge interest for programs like this with a few thoughtful questions. It was surprising to see that the word fun kept showing up over and over again – around 70% of the responses. I wouldn’t have chosen that descriptor for my lessons. To me, I was just doing what I needed to do make my lessons top notch. Apparently, this is what my families think of me. Of course, people are not going to write something rude or critical. You aren’t getting the “whole truth” here. But! This is great to consider when you think about your business and customer relationships. You can also see if your marketing messages are getting through to your families. If you emphasize that you have a “creative” studio or a “technology” studio in all of your marketing and internal communications to your families… you should see that word come through in your feedback form. Speaking of criticism… You can ask for that on your fall survey as well. I actually recommend soliciting critical feedback. I have noticed common themes in this feedback and have solved problems that people bring up. People tend to answer constructively when you word the question in a positive way. Use this opportunity to remind people of your policies or give general announcements. Put this information or policy reminder on its own page. But, don’t just include the information. Then place a “Yes / No” checkbox underneath. 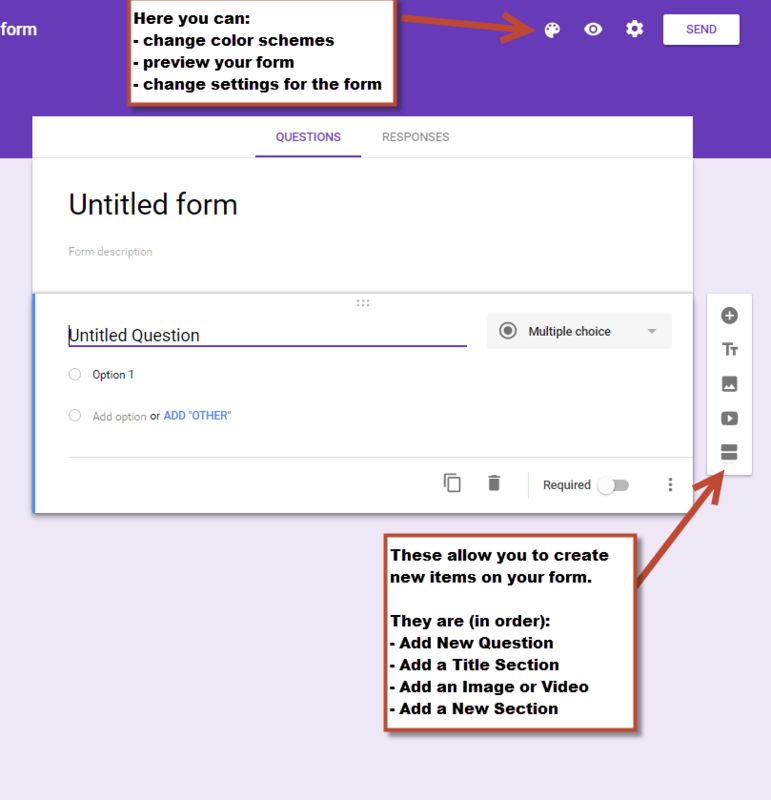 For the purposes of this article, I’m going to show you how to create a survey with Google Forms. It is a simple form builder. At this point, you can begin editing and creating your form. I like to break my forms up into pages that have a small number of questions on each page. It makes the form seem less daunting. When you begin to get responses, you can see the responses by clicking on the responses tab at the top. The answers are grouped by question, not by the responder. That means you are going to see an unhelpful list of names, dates, and responses to your questions. I then just go down the columns and start filling in slots on my master scheduling spreadsheet. With about 100 students, this takes me a few hours on a Saturday afternoon. Unfortunately, both of these are out of your control. As I mentioned in an earlier post, you are being caught in a relational triangle. This does not feel great. There’s not much you can do about it. Here’s a couple ways to make it as pleasant as possible. Keep a master list of everyone you have to email in a text file on your computer. This should be a list of their email addresses. This will cut down the amount of time it takes you to follow up with stragglers. Every two days go in and look at who has already emailed you. Remove their email from the list. Then, email everyone else. Keep hitting them every other day. Soon, you are going to get a high participation rate. Sports schedules can cause loads of stress… Unless you don’t allow it to do so! I tell parents that I will be as flexible as I can be. However, if they do end up having to switch spots from the slot they selected… they might have to settle for a non-ideal spot. For example, a Friday afternoon or evening might be less than ideal. It’s amazing what people can overlook when they are well paid. This entire blog is about improving your marketing, your persuasion, and your ability to get new piano students. Take the advice given here and run with it! The greater the demand for your services, the more you can charge. I’m sometimes tempted to grumble in the fall. I remind myself that I made a conscious decision to make life more convenient for the PARENTS in my studio. This is why they are paying me a premium rate – much higher than any other teacher around me. I have written an entire post on how to raise rates in your music studio. Take a few minutes to read that! I realize it’s easy for me to be quite cheeky and casually suggest this on a blog post. But, I am serious about this. My scheduling troubles decreased when I began to schedule 15 kids per day between 3:30p – 6:30p instead of just 6 kids per day. Many of my loyal readers have been asking me for months about how I do group lessons. I promise that I am working on this! I want to create something that will be useful and of high quality. I appreciate your patience! UPDATE: This resource was created in Winter of 2016… a 12 hour video curriculum on how to convert your studio to group lessons. Since that time, I have helped 40+ studios convert to group teaching. If you would like more information, simply leave me a message on this page. This one is simple, and I know a lot of people already do it. You should email your top 30% favorite students first. Once they’ve taken certain slots, make those slots unavailable on your form. Then email you’re next 50%. Remove those slots. Finally, send the email to your bottom 20% (pushy parents, disrespectful students, etc.). You will not be in a position where your best students are in competition with problem people. As usual, this advice hinges on strong demand for your studio. If you are hurting for the money or students, you are not in a position of strength. Your best bet is to focus on your marketing and attraction skills. My ability to demand much of my families stems from my ability to grow and maintain the student load that I want. Let’s make this the best fall ever. Whether you have a music school of 250 or a studio of 25, you can prosper by streamlining your fall scheduling. Finally… There are a lot of smart people who read this blog. Have you found a useful tool for scheduling? Do you add “creative questions” to your fall survey? Help us out! Add your suggestions and ideas to the comments below. Students at my music school pay by the school term (10 weeks) and we reserve their chosen time slot for the whole term on a first come first serve basis. I make this first come first serve basis clear to parents because even if a parent tells me that their time slot from the previous term suits them best, I am unable to reserve it for them and just hope and pray that they do infact sign up again for the new term. However, I occasionally need change a tutors days after a parent requests a particular day for the new term. But this also sometimes backfires! Just recently I got the tutor to change not only their schedule at my school but at their other jobs to allow for a requested day change from her student. In the end, the student didn’t even sign back up! What do you do if a student starts requesting different days to the availability of the only tutor for a particular instrument? The stragglers who decide to pay lessons the day before they start back or even after the term has started, often then complain and even threaten me for not having a time slot they prefer. When I didn’t have the first come first serve policy, I would often end up with tutors sitting there with lesson gaps for a whole term because I would reserve spots that didn’t end up getting paid for. How do you combat the issue of reserving private lesson times that don’t end up getting paid for? Almost all of these types of problems are communication problems. Solve that, and many of these issues go away. This is a great article, thanks Daniel. I’ve only been teaching a little while so am still figuring out some scheduling issues, not to mention wanting to start regular group lessons and concerts etc next year. I love the idea of a survey so you can find out all the times each family is available. I have a very small studio so far, so I need to find a time for groups that suits as many as possible! My question is – at what point in the year do you send it out? Here in Australia we start our academic year in Jan/Feb – would you recommend I send a survey out in December at the end of the school year, before we break for Christmas? or early Jan? I usually send it out between 2 – 4 weeks before the new schedule starts. If you are going back to school at the end of January, then sending it out around the New Year seems appropriate to me! I’m open all year, so I don’t really have that huge of a scheduling issue in the fall, however, I do have quite a few people who quit for the summer and then return in the fall. I just keep my schedule (and the other teachers in my school) online. Parents sign up online. The longer they wait to sign up, the less prime spots are available. I don’t have to do it myself. I love it. What tool do you use Julie? Just Google Calendar? I love your posts Daniel, full of useful information. Keep them coming! Thank you! Keep your comments coming! Love it! Obvious stuff is not always obvious. This is why we all have each other! Thank you so much for sharing your experience and how to use these tools. Mary, thank you for your kind words! This is incredibly helpful. I’m wondering if you feel it’s too late for me to use the survey this year since all my students that are returning have either asked for their same spot, or sent numerous emails about when they’re available. It is going to be a headache changing spots for some of them, and in some ways the survey would help me see it laid out clearly. But, I’m concerned they may balk at having to tell me again, mostly what they have already said for this Fall. I just like the format so much and the extra questions such as “what do you like about our studio?”. Thanks again for superior blogs and music Daniel, always enjoy reading. Paula in Canada. You might consider just running a survey separately – not necessarily a scheduling survey. Call it a “studio data update” …. ask them for their updated contact information. And then use some of the other suggestions I give. Great information! I’ve had a few snags with scheduling my 80 studnets this year, so the information about using surveys is helpful. However, how do you survey families who have more than one student enrolled for lessons when you need a separate form, or survey, for each student? I’ve been experimenting with Survey Monkey today and once the survey has been taken and submitted, the recipient can’t re-enter and take the survey again. I feel that if I send out an email per sibling to the family, that they will be confused. Any ideas on this? Do you have this problem with Google docs? Google will allow you to choose an option that allows people to take it multiple times. You could also just create a box that allows them to write in for their other children. What a timely post! I was just starting to seriously think ahead to my post-summer rescheduling strategy. Got some great ideas from this post. Thank you! Always look forward to your posts, Daniel! I love Google Forms and having everything populated into a spreadsheet that I can easily convert to Excel and then use color-coding to see what time slots are in most demand and also which students I can put together for group classes. Thanks for the timely info. Great idea. I am seriously going to use his idea. See, my secret plot was to create this blog to get great ideas from all of you! Thank-you for this post – I never look forward to the scheduling process. Your post is full of lots of practical ideas, thanks! I only have 20 or so students to schedule each year (private lessons only), but there is the issue of last-minute sports commitments, and everyone wanting the first spot off the school bus (for those families whose parents work and are unable to drive them to the lesson). I don’t know if I’d be able to send out my survey in waves, as you suggested. I live on an island (4000 or so people) which is a close community. Even if you don’t know every single person, word gets around. So I am worried that if I do a first wave to my favourite students, then one of the difficult persons will find out and get annoyed. I think from your own geographical map that people are a little more spread out across communities. The only solution I can think of for my situation is to send out a first email asking for response by a specific date. Then those people who respond (as well as the people I really want to target, even if they didn’t make the cutoff date, but who will know!) can be in my first wave of surveys. Thoughts? I will be the first to preach customer service. Putting the customer first. I also believe in having a job you love to do. I have a number of students in my studio that all go to the same private school. The thought has crossed my mind that people might talk if I raise my rates, or have a difficult conversation with a parent, or drop a family for being difficult. It is a tight-knit family in that parochial school. I actually had a homeschool family start gossiping about me five years ago. Had they come to me, they would have understood why I made certain choices in instructing a student the way I did. Instead, they chose to complain to everyone in their homeschool group. I didn’t lose any current students, but I did stop getting requests from the homeschool community for a few years after that. I usually got a few new each fall. In response to this, I just advertised more in other ways and to other people. At the end of the day, we have to realize that – like it or not – we are BUSINESS OWNERS first… not piano teachers!!!!! This means that not only are we the CEO… we are the CMO (Chief Marketing Officer). We need to be great at sales, marketing, growth, and attraction. Even though you only have 4,000 people to get your message out to… you have to make your message stickier, nicer, happier, and more compelling than the messages that others might put out in the world about you. Running a Facebook ad once a month to 4,000 people could cost as little as $20-$30 / month. The stories you put out in the world about your studio can shut down the haters and inspire those who are sitting on the fence. Daniel, I so appreciate that you remind us that we are business owners first and piano teachers second (I might’ve said this before). Once I started making decisions consciously based on that order, it allowed me the freedom to build a career in which I find fulfillment – where previously I’d just felt trapped by something I once loved. I think it’s not a popular sentiment in our profession, and we need to be reminded of it for the sake of longevity in our careers. Thanks for stating it clearly. And, as a long-time slave of the fall scheduling spreadsheet, THANK YOU for sharing an easier method! That order is very important… Unfortunately, most people default to thinking as a teacher first. It can be a hard habit to break. Sometimes, people don’t want to break it or don’t need to see the need to break it! Glad that this method will be another helpful tool in your tool belt! Great tips, especially emailing favorite students first! 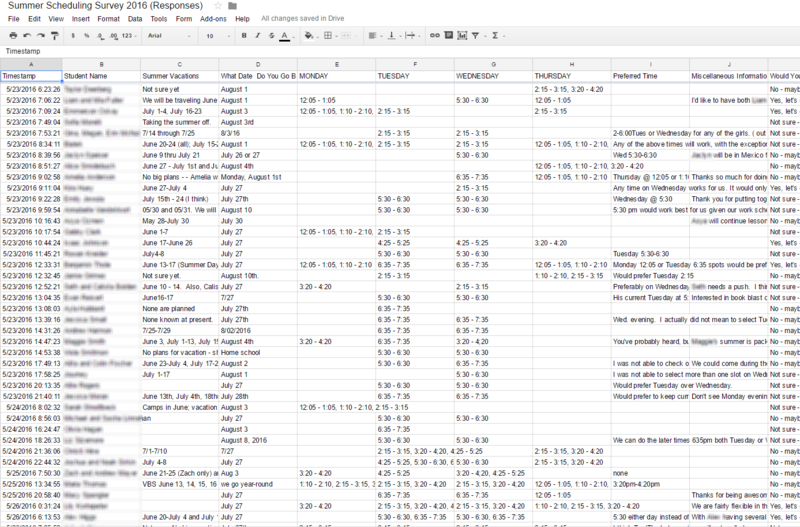 My least favorite thing about Google Forms is reading the data spreadsheet. I wish they provided an easier-to-read presentation of the results. Eager to hear more about your group lessons. Good point about the spreadsheets. I might go back into the article later today and add an extra step then… there’s a way to make it a lot easier to read.